H.B. 56 is the most recent—and most extreme—in a wave of anti-immigration laws conservative state legislatures have passed and conservative governors have signed into law. Gov. 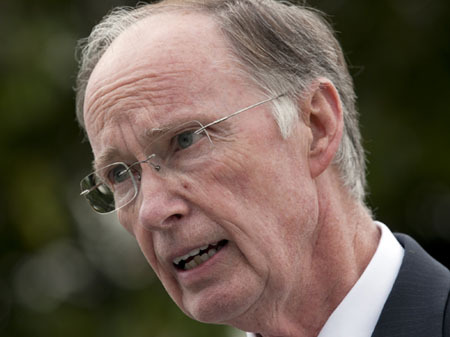 Robert Bentley (R-AL) put his pen to H.B. 56 on June 9, 2011. H.B. 56’s sponsors argue that the law is designed to make every aspect of life unbearably difficult for undocumented immigrants living in Alabama. So it should come as no surprise that when U.S. District Judge Sharon Lovelace Blackburn rejected an array of legal challenges mounted against the law and allowed a number of the most extreme provisions to go into effect on September 28, it triggered an urgent moral and humanitarian crisis. Thousands of kids failed to show up for school and thousands more have called in to the emergency hotlines established to help people affected by the law. Here we examine the law from all sides, taking a look at the status of legal challenges, the fear it’s breeding, the anti-immigration activism behind it and similar laws, and the electoral harm it’s likely to inflict on its conservative backers. The U.S. Department of Justice filed suit on August 1 to block the law as an unconstitutional interference with federal policy, and stakeholder organizations like the Hispanic Interest Coalition of Alabama challenged the law on a variety of additional constitutional grounds. But deviating from federal district judges who reviewed and enjoined similar measures in Arizona, Utah, Indiana, and Georgia, Judge Blackburn left in place many of H.B. 56’s harshest provisions. Among the extreme measures Blackburn allowed to stand was the H.B. 56 provision making it a crime to be undocumented in the state. She also permitted implementation of the provision requiring all schools to check the immigration status of their students and to report that information to the state. The judge apparently saw no issue with forcing public school officials to become immigration enforcement personnel even though every child has a constitutional right to public education regardless of immigration status. Those two provisions are temporarily blocked on emergency appeal to the 11th Circuit U.S. Court of Appeals. But they weren’t blocked before contributing to the hostile environment that led thousands of students to not show up for school and drove Latino families to flee the state. Unfortunately the 11th Circuit failed to stop other deeply troubling measures from being implemented while the legal appeals continue. The infamous “papers please” provision previously blocked by federal courts in Arizona, Utah, and Georgia, for example, is now the law in Alabama. That provision requires police to check the immigration status of anyone they suspect is undocumented and to indefinitely detain certain immigrants. Also still intact is the H.B. 56 provision that makes most contracts entered into with undocumented immigrants null and void, which leaves undocumented immigrants no recourse to combat, for example, unscrupulous employers or landlords. In addition, the court upheld the provision making it a felony for undocumented immigrants to contract with any governmental entity, including for basic services such as running water. In all likelihood, the Supreme Court will ultimately be called on to decide the central question of whether states are—as we strongly believe—constitutionally barred from pursuing these policies. Even if the Supreme Court will have the last word, the legal wrangling will take time to wend its way to a final resolution. In the meantime, communities across Alabama are feeling the harm flowing from this state-sanctioned discrimination. Reports of mistreatment, harassment, and abuse are already pouring in to emergency hotlines. To take one example, undocumented immigrants in the state are blocked from accessing the protection of the courts. A judge recently advised one woman that if she sought a restraining order against her domestic abuser she would be asked to prove her immigration status at the end of the hearing. Parents are too scared to go to work and children are too scared to go to school for fear they will be picked up by the police and deported. And the fear is not confined to undocumented immigrants. According to a 2009 Pew Hispanic Center report, 53 percent of undocumented immigrants live in mixed-status families, meaning with some legal immigrant or citizen members. So H.B. 56 is making life extraordinarily difficult for all immigrants in the state. Families with Hispanic surnames are afraid their water and utilities will be shut off unless they can prove their immigration status. Police roadblocks are springing up near Latino-frequented places of worship. And tellingly, the first person picked up as a result of the new law was a legal immigrant, illustrating the potential for H.B. 56 to be used to terrorize anyone who looks vaguely foreign, not just those without status. Indeed all people in Alabama who appear to be foreign are now under suspicion of being without status, and they are required to carry their papers at all times or risk being detained by the police. Some immigrants already decided to leave the state, while others will most certainly go deeper underground, attempting to avoid all contact with authorities. This systemic marginalization calls into question our commitment to some of the nation’s most basic values. And it raises the obvious question: Why would a state pursue such policies? Anti-immigrant initiatives continue to flourish in conservative state legislatures. They are benignly described as an expression of frustration with the federal government’s inability to control immigration. But their manifestation in extreme measures promoted through scare tactics points to something more pernicious: crass partisan politics. Alabama is a case in point. If the state were truly frustrated by the economic impacts of undocumented immigration, it would have adopted a balanced policy guided by the state’s fiscal and economic interests. Such a policy, for example, would have encouraged undocumented workers and their employers to pay their full share of taxes and required employers to provide health insurance to their workforce. But instead of a policy designed to ensure that everyone pays their fair share, Alabama declared a war of attrition against immigrants in which the objective is to make these residents vanish. Virtually every economist will agree that purging a substantial portion of your productive population will lead to economic loss and contraction. As such, it cannot be credibly argued that these attrition initiatives are designed to advance the state’s economic interests. Severe economic costs are already documented in states such as Arizona and Georgia where most of the harsh provisions were blocked and only a small percentage of immigrants left the state. The only plausible explanation for the continued advance of these initiatives, then, is the politics of division. These state initiatives did not organically materialize in response to local frustrations and they fail to provide a solution to legitimate concerns that exist with our broken immigration system. State-level conservative activists, working in concert with national anti-immigrant organizations, orchestrated them. The American Legislative Exchange Council, or ALEC, a membership organization for conservative state legislators, pushed out these initiatives to legislators around the country. Anti-immigrant groups such as the Federation for American Immigration Reform, or FAIR—an organization the Southern Poverty Law Center classified as a hate group—then actively promoted them. Their strategy is simple but effective. The nativist groups use their grassroots operations to whip local restrictionists into a frenzy and incite fear and confusion in the general population. Then ALEC arms conservative legislators in those states with model anti-immigrant legislation purportedly designed to respond to this groundswell of nativism. It’s a win-win for xenophobes and conservative legislators. Hard-line immigration restrictionists get the platform and policy change they covet while conservative legislators are rewarded with an energized segment of voters. This enables the legislators to protect their seats temporarily in the face of shifting demographics and a changing electorate. All told, six conservative states have now enacted ALEC’s model legislation designed to make life miserable for immigrants: Alabama, Arizona, Georgia, Indiana, South Carolina, and Utah. Conservative majorities controlled both chambers of every one of those state legislatures as well as the governorships. So ALEC and its anti-immigrant allies won some battles at the state level. But are they dooming conservatives to lose the war in the process? Alabama’s H.B. 56 and related state measures clarified in the starkest possible way conservatives’ willingness to sacrifice long-term electoral power in exchange for short-term political self-preservation. How else can one explain the continued demonization of Latinos, the fastest-growing segment of the American electorate? By choosing to alienate 16 percent of the American population they appear ready to spend a long cold winter in the electoral wilderness. The numbers speak for themselves. Latinos comprised 9 percent of all voters in 2008, and in every month since then around 50,000 Latinos turn 18 and are eligible to vote for the first time. Latinos will be an even more significant percentage of the electorate by 2012 in key states such as New Mexico (42.5 percent), Texas (33.7 percent), California (27.1 percent), Nevada (17.3 percent), Florida (19.2 percent), and Colorado (13.4 percent). These voters have the power to swing elections. In Indiana, where immigrants accounted for only 2 percent of the electorate, Sen. Barack Obama received 24,000 more of their votes than Sen. John McCain, which gave Obama the 1 percent margin needed to win the state. Likewise in Nevada, where polls prior to the 2010 election gave Senate Majority Leader Harry Reid (D) little chance of winning re-election, Reid ended up winning another term with 90 percent of the Latino vote and helped secure Democratic control of the Senate. And Latinos care deeply about immigration reform and the way our leaders talk about it. Why? Because 53 percent of eligible Latino voters know someone who is undocumented, while 25 percent know someone who is facing deportation or has been deported, according to a recent Latino Decisions poll. Given their personal connection to this issue it is unsurprising that immigration reform ranks consistently as one of the top issues that Latino voters care about in America. It is perplexing, then, that conservative candidates and legislators continue to bash immigrants against the backdrop of increasing Latino electoral clout. But regardless, conservatives will be confronted with a choice as Latinos become an ever-more important segment of the population: Rein in their restrictionist base and embrace the demographic shift under way or face electoral oblivion. They will have to decide whether they stand on the side of Alabama—of criminalizing students and driving them from their schools—or whether they stand for the American Dream. They will have to decide whether they stand on the side of racial profiling and ethnic animosity or whether they stand for fairness and equal protection. Alabama confronted these choices before. Now the conservative movement must decide whether they stand with the ghost of Bull Connor or for the vision of Martin Luther King, Jr. It is a momentous choice—and Latino voters will be watching. Marshall Fitz is Director of Immigration Policy and Angela Kelly is Vice President for Immigration Policy and Advocacy at American Progress.